Columbus Culinary’s goal is to provide our students with the tools they need to succeed. We try to take a personal approach to everything we do, beginning with the first admissions visit through to our career placement services. You’ll be paired with an admissions representative who will work closely with you throughout the admissions process. The Education Department’s goal is to see every student succeed academically. In addition to teaching resources and support for extra help, academic advising is readily available and staff can direct students to a variety of on and off campus resources. The Financial Aid staff is involved with students beginning with their application, continuing throughout their time at Columbus Culinary, and even after graduation. Our students and their families have a partner in helping to understand the financial investment in their education. Students begin to work one-on-one with a Job Placement professional near the end of their program. Our staff assists students in developing resumes and practicing interview skills. When the time comes, staff can help locate job opportunities, arrange interviews and assist in salary negotiations. Job Placement services are available to alumni throughout their careers. Columbus Culinary students have a variety of opportunities for culinary-related extracurricular activities. For example, there are competition teams, such as the Carving Club and the Hot Food Team, which have won medals and honors throughout Ohio. Other clubs include Baking Club, Food Nerds, Red Neckerchief Society, and the Student Senate. Students also have the opportunity to volunteer at over a dozen food service events in the community. The library provides students with relevant reference books, periodicals, and specialized program-related materials. Columbus Culinary students have access to on-campus computers and internet access. Many students use the library as a place to study. Bradford School is committed to providing equal access to the college's academic programs and services to qualified individuals with disabilities through reasonable accommodation. Students who believe they are in need of accommodations should contact the designated Section 504 coordinator, who is the Director of Education identified in the Administration, Faculty, and Staff section of this catalog (www.bradfordschoolcolumbus.edu/catalog.pdf), at (614) 614-6200. The student should provide the designated Section 504 coordinator with a current comprehensive evaluation of a specific disability from a qualified diagnostician that identifies the type of disability and lists recommended accommodations. All documentation will be reviewed by the designated Section 504 coordinator in a timely manner, and appropriate reasonable accommodations will be provided based on the individual student's needs. To find out more about our student resources as part of the culinary arts program, request more information today. CCI Hot Food Team In Action! 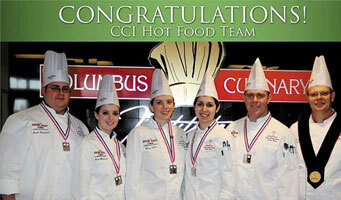 Members of the Columbus Culinary Institute's Hot Food Team earned 1st place in the ACF Ohio Junior Food Team competition.